The SecurityLine Premium System comes complete as one of 2 different product options: as a Stand-Alone System, or as an Integrated System with your current alarm hardware. Both systems are operated using the same automated monitoring service and the same SecurityLine software with video verification technology. NOTE: The DVR (Digital Video Recorder) is an optional add-on that will function with either system. The Stand-Alone system is the most simple and basic option. 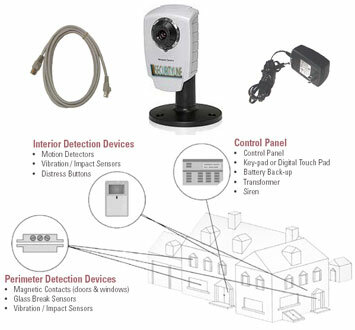 This system does not require an already present alarm system or hardware. Both the hardware and software can be self-installed by the user. The system functions as an independent unit and uses the user's own computer hardware and personal devices (ie. laptop, personal computer, phone, mobile phone, PDA, blackberry, etc..) to arm, disarm, monitor, respond, and many more functions of the system. 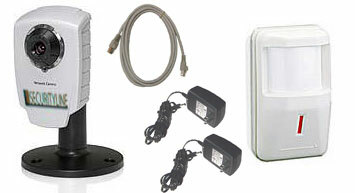 - 1 SecurityLine Digital Audio/Video Camera (wireless optional). - 1 trigger device (motion sensor is recommended). - appropriate wiring and power supplies. All hardware systems can be upgraded and customized. - an available IP or a router (ie. a local area network). SecurityLine can be easily integrated to work with your already-existing alarm hardware, should you have any. By law, the hardware must be installed by a qualified and certified alarm system installer. With the integrated system, you will be able to operate your security system via your existing alarm panel. In fact, you don't even need to change the codes! All of your existing triggering devices (motion sensors, door sensors, etc...) may be integrated easily in to the system. You will also be adding on a digital internet audio/video camera for video verification. - pre-existing alarm panel, alarm triggers and any other optional hardware.